On the 17th of March, people all over the world celebrate being Irish by donning green outfits going to church, holding parades and mostly by downing a load of pints (also green). It’s a day full of four leaf clovers, beer and cheer. And wherever there’s beer, it’s a great opportunity to loosen up and practice some new phrases from this spoken English online lesson! The traditional Irish way of saying ‘good morning. The appropriate response would be ‘and the rest of the day to you’. Yes, you heard right! St. Paddy’s a short way of referring to St. Patrick. Irish mythical creatures in the form of short men with ginger beards and green outfits. The little troublemakers go around pinching anyone who isn’t wearing green on St. Patrick’s Day! When they’re not picking on people, they’re guarding a pot of gold that’s found at the end of the rainbow. Spoken English Online Vocabulary #4 – Shamrock? Clover? They’re sometimes used interchangeably. A shamrock’s a plant that is also known as a clover. It typically has 3 leafs, but can rarely have four leafs. If you find a four-leaf clover consider yourself lucky. 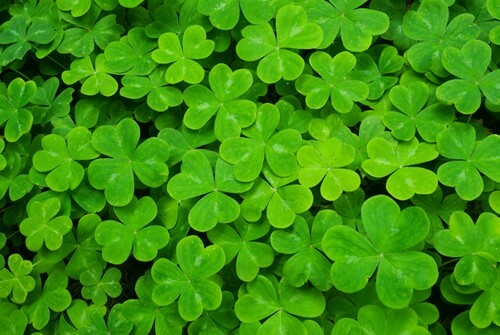 Four-leaf clovers are a symbol of extremely good luck due to their rarity! A lucky charm is an item or person that is believed to bring luck to someone. It’s something you’d wear to an important exam, or the person blowing on dice before a poker game. Looking for St. Paddy’s celebrations to practice the phrases in this spoken English online lesson? Head over to Malta and join the tons of people who hit the pubs and streets in celebration! To inquire about spoken English courses at BELS Language schools, send us an email at [email protected].